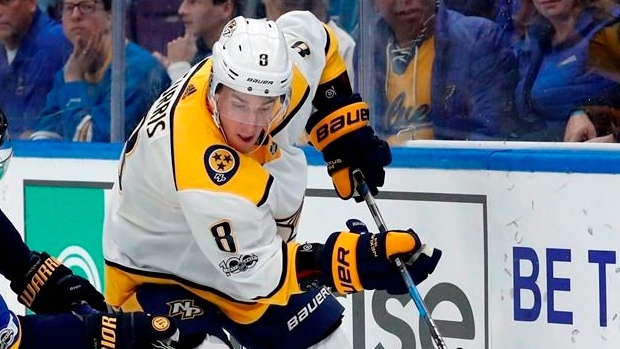 Kyle Turris is prepared for the onslaught of questions coming his way this week as he returns to Ottawa for the first time as a member of the Nashville Predators. But media members hoping for another juicy quote or soundbite about his departure from Ottawa will be sadly disappointed, as Turris says he won’t be discussing how things played out between him and Senators management back in the fall. The Senators traded Turris to Nashville as part of a three-way trade with the Colorado Avalanche in early November. The trade came to fruition largely because Turris and the Senators couldn’t hammer out a new long-term contract extension. In the three months since the trade, there has been some significant finger pointing as to why the two parties couldn’t settle on a contract – especially after Turris quickly inked a six-year, $36 million contract in Nashville. But Turris does not want his return to Ottawa to be laced with negativity and controversy, which is why he’s opting to not answer questions about his departure from the Senators organization. Instead, he wants to remember the six-plus seasons he spent in Ottawa when he steps back onto the Canadian Tire Centre ice on Thursday night. Whether he likes it or not, Turris will face a line of questions about his time in Ottawa when he meets with the media on Wednesday in Toronto prior to the game between the Predators and the Maple Leafs. At this point, Turris is not scheduled to have a media session with Ottawa reporters until after Thursday night’s game. Turris will most certainly be asked if he’s enjoyed watching the Senators’ demise in his absence. Since the trade, Ottawa has managed to win only 11 of 37 games and the club has plummeted in the standings. The Predators, meanwhile, are considered a legitimate Stanley Cup contender with Turris playing a major role on their team. The 28-year-old insists he does not take pleasure in seeing his old team languishing at the bottom of the league standings. “I have some really good friends there. It’s tough because you don’t want to see them go through that and have that type of year,” said Turris. “Hopefully it rebounds for them – but only after our game on Thursday," he added with a laugh. While many games at Canadian Tire Centre have lacked energy and emotion lately, the return of Turris should provide a significant amount of electricity in the building. Turris and his wife Julie have helped coordinate tickets for more than 60 Capital City Condors players and their family members. They spent countless hours volunteering with the Condors special needs hockey program during their time in Ottawa. After suiting up for more than 400 regular-season games with the Senators, it’s expected the club will give their former No. 1 centreman a video tribute during a stoppage in play on Thursday night. That moment should provide an opportunity for the Condors kids – and thousands of other Turris fans in attendance – to salute the player who became one of the most popular off-ice members of the Senators organization.